As part of the 16 Days of Activism Against Gender-Based Violence campaign, The United Nations Population Fund Jordan (UNFPA), collaborated with Seven Circles and cartoonist Omar Al Abdallat to bring the 'Women Empowerment' Cartoon Competition to Working Dreamers. 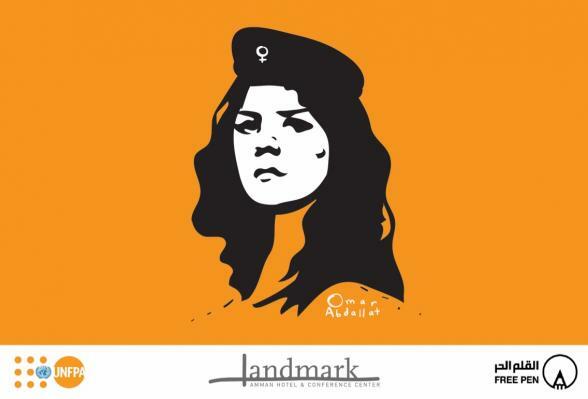 "To mark the campaign this year, we wanted to find an innovative way to shed light on gender-based violence," said Laila Baker, UNFPA Jordan Representative. "We think cartoons can provide a fresh take on a subject matter that is often times not easy to explore." 1. Underage by Alaa Rustum won based on highest number of votes. 2. Marriage of Minors by Doaa El Adl won based on jury choice. Winners received $500 each by the Landmark Amman Hotel. Examples of the work of children from SOS village based in Aqaba, Jordan. Domestic violence has many faces. It brings fear, shatters the person and takes away their freedom. الزواج المبكر يحرم الفتاة من تلقي التعليم الجيد الذي سيعود بالفائدة عليها وعلى أسرتها وعلى المجتمع ككل. Child bont know any thing about marriage, they have thought this is a game but they lost their future with this (child marriage) game. All around one advisers do what to do with whom and what to do. As strong as you might think you are as a man, never overlook a woman just because of her gender.